Being one of the square western states does not mean that Colorado is square at all. If you're looking for skiing, fly fishing, hiking and an infamous cannibal this is the state for you. The traditional home to several Native American tribes, the first Europeans were Spanish settlers following the Rio Grande. After the Mexican-American War the Colorado Territory was created and eventually became a state on August 1st 1876. Today the state of Colorado is known for its great outdoor activities and delicious breweries. The summit of Mount Elbert at 4,401 metres elevation in Lake County is the state's highest point and the highest point in the entire Rocky Mountains. Colorado has approximately 550 mountain peaks that exceed 4,000 metres elevation. Colorado is the only U.S. state that lies entirely above 1,000 metres elevation. The state's lowest elevation is 1,010 metres at the point on the eastern boundary of Yuma County where the Arikaree River flows into the state of [Kansas], which is higher than the highest point of 18 states. A little over one third of the area of Colorado is flat and rolling land. East of the Rocky Mountains are the Colorado Eastern Plains of the High Plains, the section of the Great Plains within Colorado at elevations ranging from roughly 1,020 to 2,300 metres. The Colorado plains are usually thought of as prairies, but actually they have many patches of deciduous forests, buttes, and canyons, much like the high plains in New Mexico as well. Eastern Colorado is presently mainly covered in farmland, along with small farming villages and towns. Boulder is a liberal town home to the university of Colorado right on the foot hills. Colorado Springs is the home to Pikes Peak and the Christian Right. Denver is the mile high city. Durango is the major city in the Southwest nestled in the San Juan Mountains. Fort Collins is home to Colorado State University and one of best breweries in Colorado. Pueblo is an old industrial town on the southern side of I-25. Black Canyon of the Gunnison National Park is a United States National Park located in western Colorado and managed by the National Park Service. There are three entrances to the park. The south rim entrance is located 24 kilometres east of Montrose, while the north rim entrance is 18 kilometres south of Crawford and is closed in the winter. The park contains 19 kilometres of the 77-kilometre long canyon of the Gunnison River. The national park itself contains the deepest and most dramatic section of the canyon, but the canyon continues upstream into Curecanti National Recreation Area and downstream into Gunnison Gorge National Conservation Area. The canyon's name owes itself to the fact that parts of the gorge only receive 33 minutes of sunlight a day, according to Images of America: The Black Canyon of the Gunnison. In the book, author Duane Vandenbusche states, "Several canyons of the American West are longer and some are deeper, but none combines the depth, sheerness, narrowness, darkness, and dread of the Black Canyon. 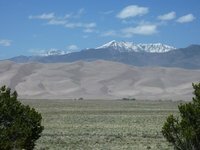 The Great Sand Dunes National Park is located in southern Colorado and is one of the latest national parks created, in 2004. Before that it was a National Monument. Compared to many other national parks in the country, including the most famous two in Colorado, Rocky Mountain National Park and Mesa Verde National Park, the park is not visited that often. Still, it's a popular place to hang out for half a day or more if you are keen on taking longer hikes. Most of the sand originated in the San Juan Mountains, about 65 miles to the west. Wind and water are the primary movers of the sand. Streams, creeks, melting snows and flash floods brought bits of rock out of the mountains to the valley floor. Southwesterly winds then began the slow process of bouncing the sand toward the low curve of the Sangre de Christo Mountains. There they pilled up at the base of the mountains or dropped into creeks to be washed back out toward the valley floor. Although research is still continuing, most researchers agree that the situation is like this at least for 12,000 years but probably much longer. Ever see the picture of Cliff Palace in the American Southwest and wonder, where in the world is that? Mesa Verde National Park is where the majority of easy to access cliff dwellings are located and is a UNESCO World Heritage Site. 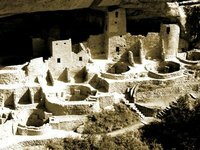 These stunning homes were built in cliff alcoves, which were dug out by natural springs, in the sides of canyons of Mesa Verde near present day Cortez (Colorado). The builders of these amazing towns are the ancestors of the current day Pueblo People that live further south in current day New Mexico and Arizona. The ruins at Mesa Verde are considered to part of the Ancestral Pueblo People heritage. In the past, the term Anasazi was used to describe the inhabitants of these ruins. This is no longer a proper term because Anasazi is actually a Navajo word that means “ancient enemies.” Current day Pueblo peoples find the term Anasazi offensive. Rocky Mountain National Park in northern Colorado was USA's tenth national park, a status it achieved in 1905. 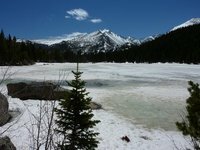 The park is approximately 40 kilometres from north to south and 32 kilometres) east to west and covers a particularly wild and scenic part of the Colorado Rockies. Much of the area is over 3,600 metres above sea level and here the landscape resembles the arctic tundra. Main access is via Estes Park on the eastern side and the smaller Grand Lake on the west. These are the only towns bordering the region and both offer a good choice of accommodation. As its name suggests, the main feature of the park are the Rocky Mountains themselves with the continental divide ridge passing more or less through the middle of the park. The rivers on the eastern side flow eventually to the Atlantic while for those on the west, the Pacific is a final destination. The only road in the park to cross the divide is Trail Ridge which does so at Milner Pass. The altitude varies from just over 2,100 metres around Estes Park to over 4,200 metres at the summit of Longs Peak. Colorado is a big area for skiing. There are over a dozen major ski areas with terrain for any ability level. Although many of the bigger ski areas have become very corporate and expensive there are still some smaller ones with lots of charm. Remember that there is plenty of skiing outside of I-70 or Summit County. Canyons of the Ancients near Cortez. Glenwood Hot Springs located in Glenwood Springs is a huge hotspring complex that has over a million gallons of water in it. Colorado's weather is best described as diverse and extreme, with big differences between seasons and between places in the state. The eastern parts are generally much drier than the central and northern parts. Generally temperatures decrease with altitude while precipitation increases. Snow and temperatures below zero are common in the Rocky Mountains and the extreme north in winter, while at the same time daytime temperatures can be over 20 °C in the south. But even here nights in summer can be below zero! Extremes range between 48 °C and -52 °C, a difference of exactly 100 °C. Generally, weather is best for travelling around between late May and early October. The climate of the Eastern Plains is semi-arid with low humidity and moderate precipitation, usually from 380 to 630 mm annually. The area is known for its abundant sunshine and cool clear nights. West of the plains and foothills, the weather of Colorado is much less uniform. Even places a few miles apart can experience entirely different weather depending on the topography of the area. Most valleys have a semi-arid climate, which becomes an alpine climate at higher elevations. Humid microclimates also exist in some areas. Generally, the wettest season in western Colorado is winter while June is the driest month. Denver International Airport (DEN) is located on the northeast side of the city and is one of the largest airports in the world by size! It is the main gateway to Colorado, apart from a few much smaller regional airports. Around 20-25 airlines serve Denver and international destinations include Mexico City, Montreal, Toronto, London, Cancun, Cozumel and Vancouver. All other destinations are domestic ones, including flights to Alaska, Hawaii, Los Angeles, Miami, San Francisco, Houston, Seattle, Detroit, Chicago, Washington, D.C., Boston, Minneapolis, Atlanta, Philadelphia and Dallas. Most of the domestic flights are operated by Southwest Airlines, United Airlines, Skywest Airlines and budget airline Frontier Airlines. The California Zephyr travels between Denver and Chicago and Denver and Emeryville (San Francisco). The main two Interstates that cross Colorado are the I-70 east to west (connecting to Kansas and Utah respectively) and the I-25 north to south (connecting to Wyoming and New Mexico respectively). They meet near Denver. The third Interstate is the I-76 which runs northeast from Denver towards Nebraska, meeting the I-80 there. There are some intrastate flights that can be of use. Colorado has a number of National Scenic Byways which offer a great way to explore the state crossing beautiful landscapes. Mostly, there are lots of national parks, state parks or monuments along the way and it's generally a better alternative than the faster but boring Interstate Highways. Sometime during your stay, a giggling friend will attempt to get you to eat a plate of Rocky Mountain Oysters. When asked, even your waiter or waitress will be coy about giving a straight answer. Don't be fooled, however. There are no fresh water molluscs thriving at high altitude. These oysters are bull or sheep testicles, flour battered and pan fried. Colorado and drinking are often linked. It dates back to the grizzled fur trapping, mountain man days of the 1840s, when some of the state's pioneers would hole up in Bent's Fort and drink themselves blind with earthen jugs of "trade whiskey' - a dubious combination of "red eye" whiskey, hot chili peppers, plug tobacco and gunpowder. (A gourmet recreation of the drink can still be sampled at The Fort Restaurant, in Morrison, Colorado). Colorado is only behind Vermont, Oregon and Montana in microbreweries per capita and considers itself the beer capital of the United States. (Denver is sometimes referred to as the, "Napa Valley of Microbreweries"). The magazine "Modern Drunkard" is headquartered in Denver. Brewpubs are open in almost every town. Denver also hosts the Great American Beer Festival every Fall. This three day bacchanal celebrates micro, medium and mega brews from across the country with awards handed out to the judges picks for best brews. There are also less celebrated, but equally worthy, meaderies and vineyards throughout the state. Colorado's nascent wine industry has exploded in the last 20 years. While there are now over 70 wineries in Colorado, ranging from the mountains to the plains, the communities of Grand Junction and Palisade on the Western Slope rightly label themselves as, Colorado's Wine Country. The high desert farming town of Palisade witnessed the birth of the state's modern vineyards in the '70s and early '80s. Even today, a majority of the state's wine grapes are grown in this tiny Victorian town in the federally-designated Grand Valley American Viticultural Area. (AVA). Palisade also hosts the Colorado Mountain Winefest every September at harvest time. Alpine Trail Ridge Inn - 927 Moraine Avenue ~ Estes Park, Colorado 80517. (800) 233-5023. The Alpine Trail Ridge Inn is a local favorite for convenient and affordable lodging. Dakota Lodge condo in Keystone is near the main plaza area of River Run Village, Keystone's premier location. 2 minute walk to the new gondola. Fawn Valley Inn - 2760 Fall River Road Estes Park, CO 80517. Phone: (970) 586-2388. Fawn Valley Inn offers an attractive range of fully-equipped accommodations including Jacuzzi suites, hot tub suites, one-, two- and three-bedroom Estes Park condos, cozy cabins all with beautiful river and mountain views. Hotel Lenado - 200 S. Aspen St. Aspen, CO 81611. 1-800-321-3457. 970-925-6246. Award-winning accommodations with a rustic flare. Lazy R Cottages - 891 Moraine Avenue Estes Park, CO 80517. Phone: (970) 586-3708. Just one mile from Rocky Mountain National Park, this cabin offers one-, two- and three-bedroom cabins perfect for romantic escapes and family vacations. Lofts of Estes - 150 E. Riverside Drive Estes Park, CO 80517. Phone: (970) 586-2824. Luxurious, modern condos just steps away from downtown Estes Park and the beautiful Riverwalk. Marys Lake Vacation Condos - 2625 Marys Lake Road Estes Park, CO 80517. Phone: (970) 586-4975. Enjoy spectacular views in modern, spacious condos. Beautifully decorated and richly-appointed with full kitchens, fireplaces and comfort throughout. Red Hawk Lodge, closest to the new River Run Village gondola. The Hotel Columbia - 301 West San Juan Ave. Telluride, CO 81435. Phone: (970) 728.0660. This Telluride accommodation sits directly across the street from the main ski resort gondola. The Springs is located in River Run's most popular building. It has a panoramic view of the ski runs and building pool area. Timber Creek Chalets - 2115 Fall River Road Estes Park, CO 80517. Phone: (970) 586-8803. The perfect resort for nature lovers! The cabins and chalets (some with personal hot tubs) offer beautiful views and hiking from your front door. Valhalla Resort - 2185 Eagle Cliff Rd. Estes Park, CO 80517. Valhalla Resort boasts a variety of cabins bordering Rocky Mountain National Park. WestWall Lodge at Mt. Crested Butte - 14 Hunter Hill Rd.Mt. Crested Butte, CO 81225. Phone 970.349.1280. WestWall Lodge provides direct ski-in, ski-out access to some of Colorado’s best ski terrain and summer hiking-biking trails at the base of Crested Butte Mountain Resort. Wild Horse Inn - 1536 County Road 83, Fraser, CO 80442, Phone: 970-726-0456. A unique and intimate Winter Park lodge just minutes from all of your favorite mountain activities. We have a comprehensive list of accommodation in Colorado searchable right here on Travellerspoint. You can use our map to quickly compare budget, mid-range or top of the range accommodation in Colorado and areas nearby. This is version 76. Last edited at 8:25 on Dec 23, 16 by Utrecht. 56 articles link to this page.